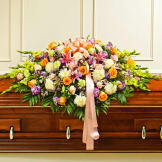 A beautiful full casket spray to share memories of a life full of love. • Arranged with carnations, orchids, baby's breath, jade and blanket of plumosa (pictured on casket here). • Measures 30"H x 90"W x 32D. 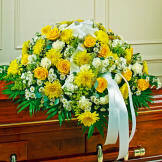 Flowers will be received by a Allen Funeral Home and Crematory's staff. 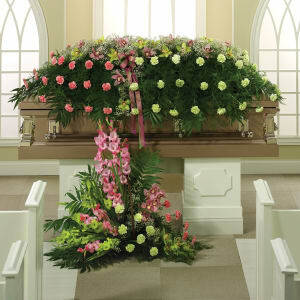 All of our flowers are designed and delivered by hand from a local florist in in Bloomington.